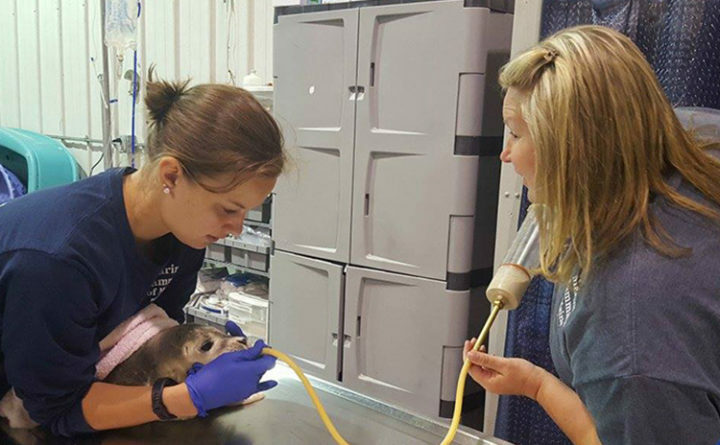 Marine Mammals of Maine founder Lynda Doughty, right, works with a volunteer to administer fluids to a rescued seal pup. Harpswell’s Lynda Doughty, founder of Marine Mammals of Maine, was honored Wednesday for her work with stranded seals during the summer of 2018. Doughty received the David St. Aubin Award of Excellence from NOAA Fisheries Greater Atlantic Region Marine Mammal and Sea Turtle Stranding Programs. Marine Mammals of Maine was founded in 2011 in Harpswell and is the only authorized organization covering 2,500 miles of Maine’s southern and midcoast coastline, including the islands. The organization responds to reports of stranded, injured, and entangled marine mammals and sea turtles, and operates a triage and rehabilitation center for seals. From July to September 2018, Doughty and her team responded to more than 800 live and dead seals on beaches in southern and midcoast Maine. They continue to monitor local populations for evidence of phocine distemper virus, according to a release from NOAA. The award was presented to Doughty during the annual Greater Atlantic Region Marine Mammal and Sea Turtle Stranding Network conference in Freeport. Doughty, who was nominated by her peers, took on the role of “on site coordinator” for the “unusual mortality event,” leading the network in its response to more than 2,000 stranded seals in the past nine months from Maine to Virginia, according to the release.